The early pressure was all Bradford but they lost Rhys Evans early on with what looked like a dislocation as he was replaced by Sam Hallas. Dewsbury took the lead, a little against the run of play, when a delicious Sam Day miss-out pass went to Kyle Trout to spin away from the defence and ground under the sticks. Liam Finn added the easy conversion for a 6-0 lead. On twenty-three Dalton Grant was in space on the outside to take the ball, evade the last tackler and go ten metres to score. 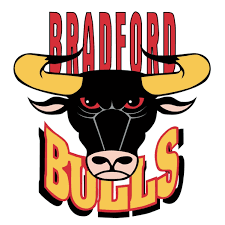 Jordan Lilley was unable to add the touchline conversion, the Bulls trailing by 4-6. Mikey Wood was sin-binned on thirty-four for lifting an opponent into a dangerous position, Bradford to finish the half with a man down. With second left in the half Dalton Grant pushed his way through the last line of defence and dropped on the line to score. The final hooter sounded as Lilley pushed his conversion attempt wide of the posts. Rowan Milnes gave the Bulls the perfect start to the seconbd half when he took theball ten metres out and jinked his way between four tacklers to ground. Elliot Minchella took overthe kicking duties and slotted his kick between the uprights, the Bulls now 14-6 ahead after forty-four minutes, making a mockery of being a man down. On sixty-six Minchella scored the try to seal the Bulls victory as he found a chink of light to go between two defenders and score by the right corner flag. He converted brilliantly from the touchline for a 20-6 lead. On seventy-three the Rams got their first try of the second half as Dale Morton found a gap and broke from his own forty to the Bulls twenty before finding full-back Luke Hooley in support to complete the move and score down the left wing. Finn added the extras from wide for 12-20. This was no walk over for the Bulls against a determined Dewsbury side who gave the game their all. Bradford took, and then extended, their lead when they were down to twelve men. There were plenty of errors from both sides but the game was played in a good spirit by two sides who were willing to give the ball some air. Bradford remain in touch with the play-off places while Dewsbury have a lot of work to do to get themselves into the play-off positions. Bulls: Ryan, Grant (2T), Evans, Webster, Foggin-Johnston, Lilley, Milnes (T), Kirk, Wildie, Crossley, Storton, Farrell, Minchella (T, 2G). Subs: Bustin, Wood (SB on 34), Flanagan, Hallas. Rams: Hooley (T), Worrincy, Trout O, Ryder, Morton, Knowles, Finn (2G), Annakin, Day, Trout K (T), Walshaw, Kibula, Igbenidion. Subs: Ward, Field, Sherriffe, Garratt.